Saturday I told you about the train-themed birthday party I threw for my favorite little two-year-old. We had ride on trains, train-themed snacks, and a train cake! 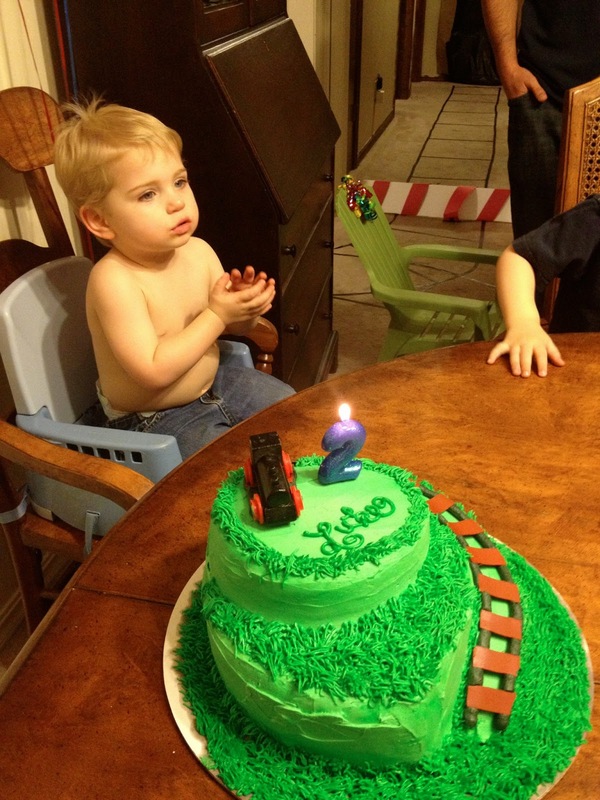 Conductor Luke was one happy birthday boy. I said I'd share more about the cake, so here goes. 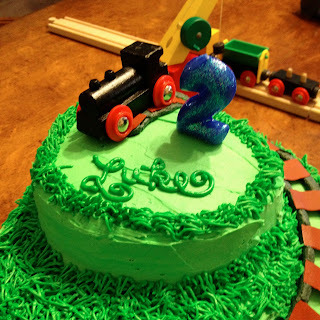 To be honest, it all started out quite simply - I was going to make a round cake, put some of Luke's tracks around it, and pipe his name on top. Nice and easy. 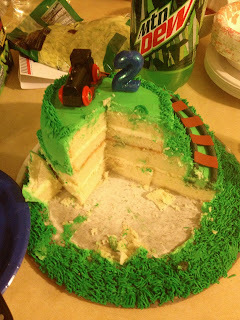 Then I realized I could do a two-layer cake with the tracks around it. 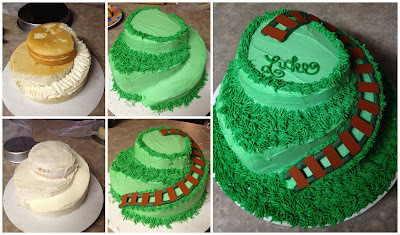 Or I could do a two-layer cake with the tracks on TOP of the bottom layer and around the top layer. 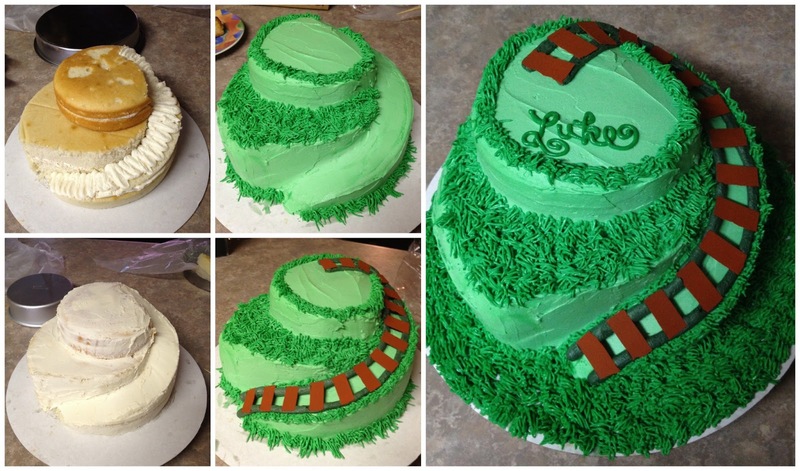 OR I could create the tracks out of cake...and make them swirl down both levels...and add grass! Yeah...went kinda off track there. But it turned out great, so it's okay, right? I made two 9-in and one 6-in cakes (using my vanilla cake recipe copied below). Once cooled, I added buttercream between the two 9-in layers, sliced the 6-in cake into two layers and filled with more buttercream, and stacked the cakes like I wanted. Then, using toothpicks, I outlined the curve I wanted to get with the tracks. Finally, using a sharp, serrated knife, I carved out the tracks, following the lines made with the toothpicks. Tip: This works a lot better with chilled (or slightly frozen) cake. Just stick it in the freezer for a couple of hours before you start carving. Once carved, I added the crumb coat to the cake and put it back in the fridge to chill for a few more hours. Then, I tinted a batch of vanilla buttercream icing a nice leaf green and iced the entire cake. 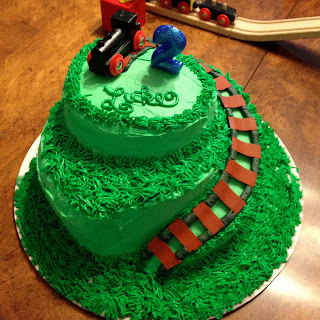 Next, I added additional green coloring to the remaining buttercream and, using Wilton tip #233, added grass to the edges, flat areas, and cardboard around the cake. Finally, I used grey icing and Wilton tip #1A to make the tracks, adding small rectangles of brown sugar sheets to finish them off. Once at the party, we topped the cake with a train from Luke's collection and a bright blue "2" candle. 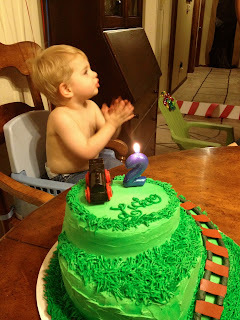 The cake was a hit - the birthday boy had two slices all on his own! Glad you enjoyed it, kiddo! Preheat oven to 350F and prepare pans. In the bowl of an electric mixer, beat butter and sugar til light and fluffy. Slowly add in egg whites, one at a time, beating well between each addition. Beat in vanilla. Alternately add dry ingredients and sour cream, bookending with the dry ingredients, and mix until just combined. Invert onto wire rack and let cool completely. Two years ago our friends Mark and Jenny had the sweetest little baby boy - Luke. 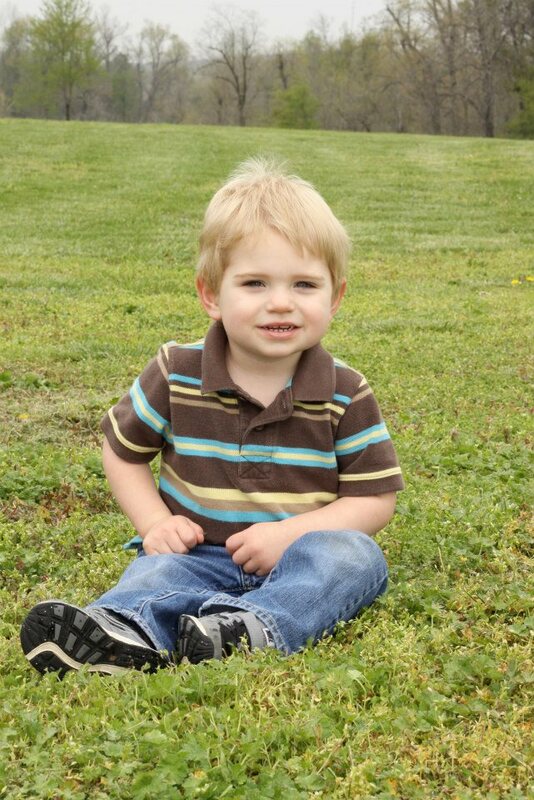 Now that little baby boy is walking, talking, and looking far too much like a little boy than a baby. 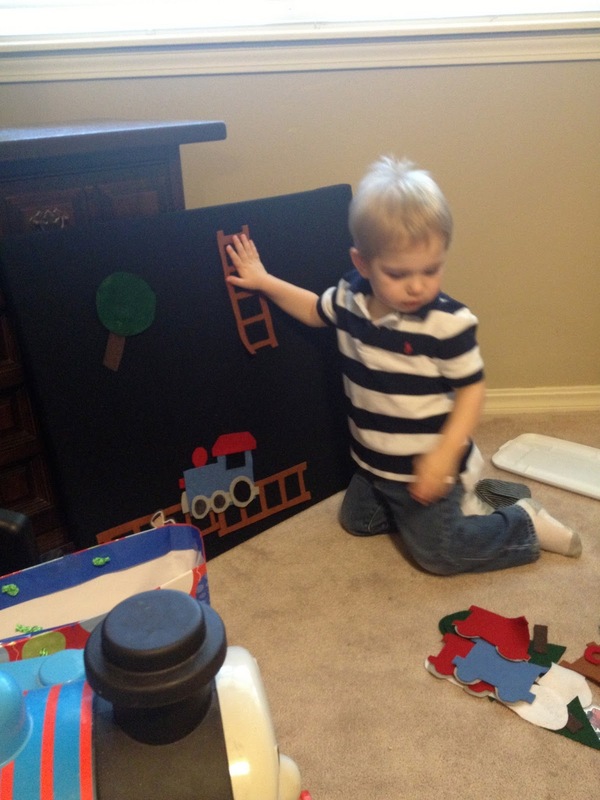 Conveniently enough, Luke's collection of trains gave us a good start on the decor. 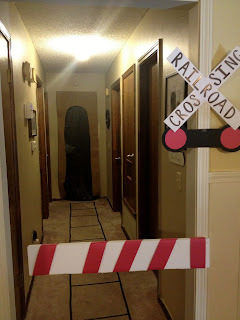 Taking inspiration from the little guy, multiple Pinterest searches, and some quick brainstorm sessions, we put together a fabulous train party that didn't break the bank. 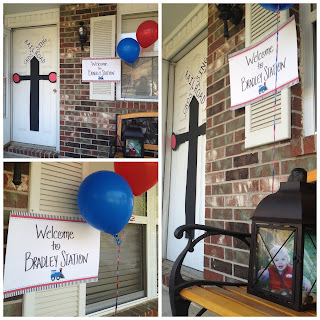 The kiddos loved it and the adults had a great time, too. We might have let Luke have one too many pieces of cake...but you only turn two once, right? 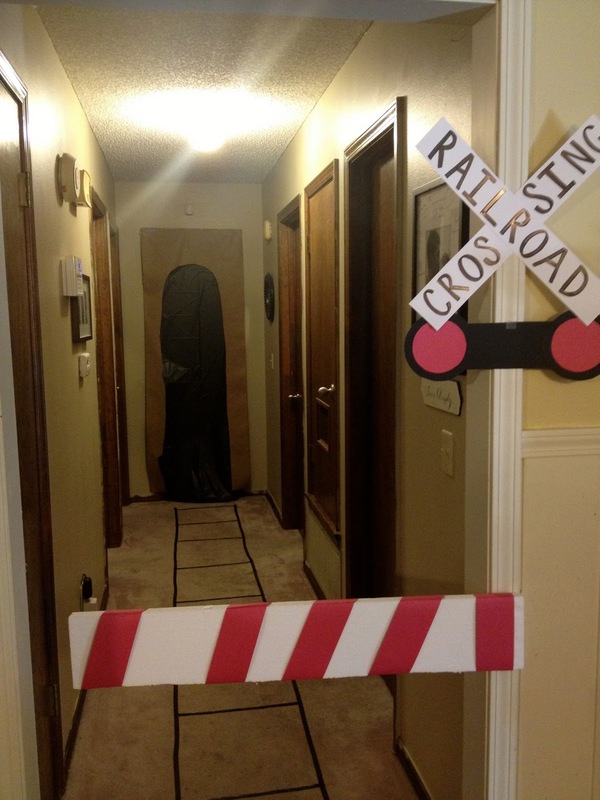 We included official crossings with bars and even a tunnel at the end of the hall. The food table, aka "Dining Car"
And of course, the "Cakeday" cake. Had a BLAST making this one. 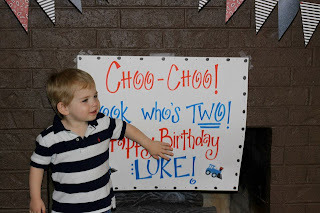 Had so much fun putting this party together! And seeing him enjoy it made it even better. Thanks for letting me be part of Luke's special day, Jenny! 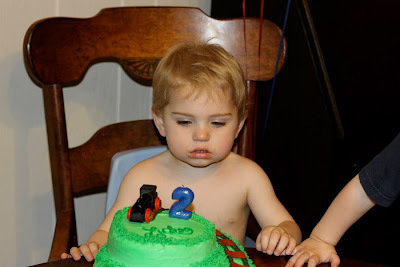 Check back tomorrow for a few more details on that cake. To follow up my previous post about "Where to Eat" in Fayetteville, here's my list on "What to Do." One of the greatest blessings we have in NWA. This museum of American Art is located just up the road from Fayetteville in Bentonville (our sister city and home to Walmart’s World HQ). The museum is free to the public (THANKS WALMART!) and has art that would interest anyone – including Warhols, Rockwells, Cassats, and Durands. You could spend as much or as little time here as you’d like. Oh, and the trails are a great way to spend the afternoon if you have the time and the weather permits. Also, right now, they have a special Norman Rockwell exhibit. It’s $12/person, but worth the spend. Fayetteville: One of my favorite places in Fayetteville is the square – shopping, eating, and just overall precious, small-town-ness. Stop by and take a stroll around. You’ll fall in love with the city just like I did. Bentonville: A nice stop after a visit to the museum – tons of cute little shops, a coffee shop, and some fantastic restaurants. Located on the Bentonville Square, this sweet little museum is a nice tribute to Mr. Sam and his vision. You can see his old truck, read old letters, take a look around his office, and visit an old mockup of the Walton Five & Dime. It only takes about 20 min to tour and it’s free, so it’s a nice way to fill time. There are surprise piggies hidden all around the city. You can just hope to stumble up on a few (and you probably will), or you can check out the website for a map and city tour. See my post about the Pigs for more info on this. Located just about 30 min outside of Fayetteville, Terra Studios is a tourable glass-blowing factory. They make the infamous Bluebirds of Happiness here and the grounds have been turned into a fun little park. Great place to go with kiddos. YOU CAN HOLD BABY LIONS! (provided they have cubs at the time). Even if they don’t, this drive through zoo is a great way to spend an afternoon. Animals just wander the grounds and you drive the trail in your car and watch them. They have all sorts of fun creatures. And the petting zoo part lets you hold monkeys and other small things. It’s about a 45 min drive from Fayetteville, but SO WORTH IT. 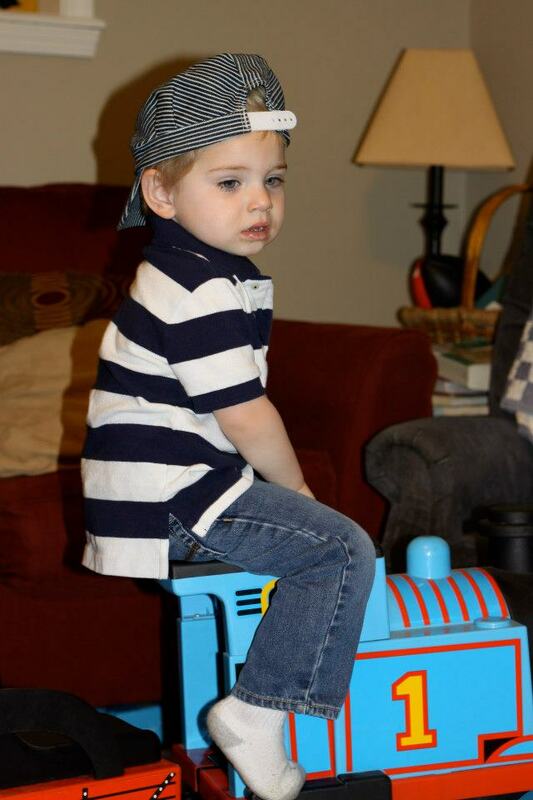 I rarely miss this sweet little gem on Saturday mornings. The Fayetteville Farmers’ Market has been named the “Favorite Farmers’ Market in America” and I totally agree. It’s such a perfect snapshot of our town – all sorts of people, with kiddos and dogs, wandering, chatting, and just enjoying each other’s talents. If you’re in town on a Saturday morning, this is a MUST see. Located on the Fayetteville square, this sweet little boutique is locally owned and operated by the fabulous Kirsten Blowers. She’s a U of A graduate, an incredibly sweet person, and a fantastic designer. Her eye is impeccable and the items she keeps in her store are so lovely that I have to keep myself from going in because if I do, I WILL buy something. It’s dangerous. 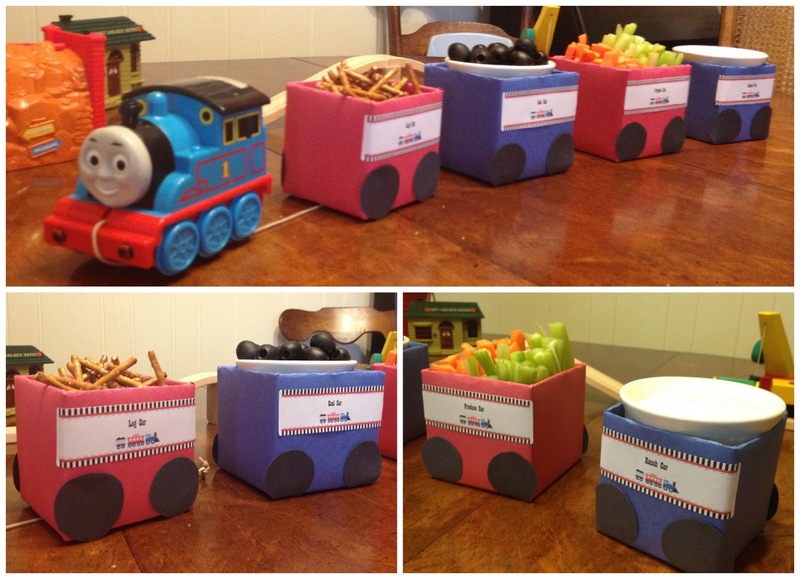 She also has an online store – go check her out! Just down the block from Riffraff, this store is basically a local version of Urban Outfitters – unique style, fun items, friendly folks. We have so many! If that’s your thing, Fayetteville will be your best friend. Hope you enjoy any and all of the above you visit! 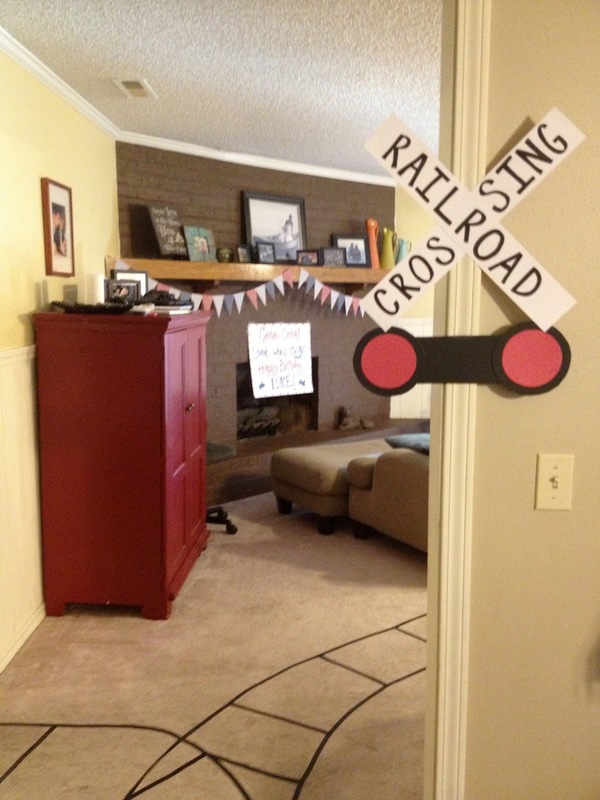 Now I'm off to put the finishing touches on a train-themed party for the cutest two year-old in the world. Hi friends! How's life? Good? Good! So, here's the thing, I have some family friends headed to Fayetteville this weekend and they reached out for some fun things to do around town. As I started thinking about where to send them, I realized that other folks might also be interested in some of the fantastic things Fayetteville has to offer - so I'm putting them out here for y'all to see! I also realized that I have A LOT of Fayetteville things...so I'm splitting them into a "Where to Eat" list and a "What to Do" list. Cool? Cool. Cool cool cool. This sweet little coffee shop is locally owned and operated – meaning it just feels like Fayetteville. I have spent countless late nights and early mornings, not to mention afternoon coffee breaks, in both the Gregg Street and Dickson Depot locations. Not only is the coffee fantastic, the baristas are super friendly and they have the most amazing pastries (and crepes if you’re at the Depot location). I mean really, try the whole wheat cinnamon peach muffins at Gregg Street and tell me I’m wrong. I dare you. A Fayetteville classic. This place has been around for over 20 years and has received numerous people’s choice awards. They’re known for their cakes (which, by the way, are fantastic. If you’ve been to ANY party I’ve thrown since living in Fayetteville, you’ve had Rick’s cake or petit fours). But they’re awesome at more than cakes – they have a huge selection of pastries and donuts (which you can customize to your liking…maple bacon donuts anyone?) and even hot breakfast items like sausage rolls (another local favorite), ham and cheese croissants, and biscuits and gravy. If you need a go-to, kid-friendly breakfast place, this is your answer. Just off the square (making it a fantastic stop after the Farmers’ Market on Saturdays), LBC has tons of deliciously unique breakfast options, all made with local ingredients. They also tend to have gluten-free and vegan options, for those of you that are so inclined. Oh, and did I mention the patio? The patio, guys. The patio. Wanna have breakfast inside a fairytale cottage? Want cinnamon rolls the size of your head and cupcakes with perfectly sweet frosting? Or, is chocolate gravy with a side of bacon more your speed? Either way, this place is a must-see. It’s absolutely precious, y’all. And the food? Oh my goodness…LOVELY. Note: They’re closed on Mondays, unfortunately. Mondays just got so much worse. Lookin' for burgers? Go no further my friends. This place is one of the first “classic Fayetteville” spots the locals insisted I try when I moved up here. Ever since, it’s been one of the first suggestions I make to visiting friends or new Fayettevillians. They’re known for their burgers, my favorite being the Bleu Moon Burger (yes, it has bleu cheese on it and yes, it’s as fantastic as it sounds), but their menu is much more exhaustive than that. I also love to get the crepes (for dinner OR dessert! Guys…grasshopper crepes! No, not the bugs. As in crepes filled with mint ice cream & covered with homemade hot fudge sauce…just sayin’), or any of the sandwiches. You really can’t go wrong here. Also, pro-tip, a basket of fries feeds like three. Now you know. They also have fantastic soups, fun hot dogs, and more “plain” options for the kiddos. And don’t forget to order the blueberry iced tea. Ah-may-zing. I can’t pick a favorite Thai restaurant in Fayetteville. Both these guys are fantastic. If Thai is your thing, you can’t go wrong with either. The atmosphere at Taste of Thai is a bit more “Fayetteville-y,” but the service is more intimate at Twin Kitchen – like you’re eating at their house. Really…I just can’t pick a favorite. Good ol’ fashioned home-cooked classic Italian fare. Tiny restaurant in a semi-sketchy looking location, but wonderful food. I think they may use a full stick of butter in each dish. To be clear, I’m not complaining about that. Great for a date night or a celebratory night out. Sure this is technically in Bentonville…so it’s not a “Fayetteville” favorite, but it’s good enough to make the list. It’s a food truck typically parked off the Bentonville square that serves wonderful crepes cooked up by the sweetest little French family. They have sweet and savory options, and choices for breakfast or lunch. And, since the crepes are made with buckwheat flour, I get to tell myself I’m being healthy! Buckwheat makes Nutella healthy, right? Again, not a Fayetteville establishment, but a long-time favorite. I used to swing by here for lunch when I was working up in Bentonville – loved eating a crisp salad or a sandwich on fresh, fluffy bread out on their patio (especially if Lauren was there). They use local, fresh ingredients and you won’t find a higher quality salad anywhere. Trust me. OF COURSE I have to mention a cupcake place. 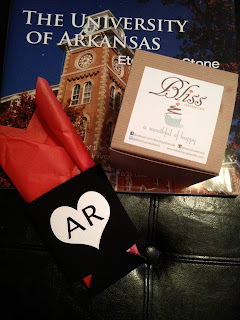 There are two Bliss locations in Fayetteville…one is unfortunately close to my office, the other is oh-so-conveniently located just off the Square (making it waaaay to easy to stop after a market visit). The frosting on these cakes is fantastic, and their red velvet cake is yummy (oh, and they have gluten-free options!) If you happen to be visiting on one of the days they have their honey-lavender cakes, GET ONE! Matter of fact, get TWO and bring me one, please. Lovely. Just lovely. I don’t eat ice cream often, but I do enjoy the occasional fro-yo stop. This place is just off Dickson Street (the social hub of Fayetteville), and is one of those pay-by-the-weight yogurt places. They’ve been about a thousand different names over the last five years, but, despite the changes, they usually have mochi, which makes me SUPER happy. Also, their tart yogurt flavor is a nice blend of sweet and, well, tart. Worth a try. Fayettevillians, did I miss any? Let me know your favorites, too! Visitors, ENJOY! and check back tomorrow for the "What to Do" Edition! I know I promised this recipe yesterday, and I apologize for my tardiness in posting. This weather has been wreaking havoc on my sinuses and I just haven't been myself. Anywho, on to the fun part - my recipe for Cadbury Egg Cupcakes: milk chocolate cupcakes with a Cadbury creme filling and a Cadbury creme buttercream. Enjoy! In a stand mixer (or with a hand mixer and a large bowl), beat the butter at medium speed until soft and creamy. Add the sugar and beat for two minutes, til blended. Add the egg, then the yolk, beating for 1 minute between each addition. Beat in the vanilla, then reduce the mixer speed to low and add half the dry ingredients, mixing only to combine. Add the buttermilk, mixing until incorporated, then mix in the remaining dry ingredients. Add the melted chocolate, mixing it in by hand with a rubber spatula. Divide the batter evenly into lined cupcake tins. 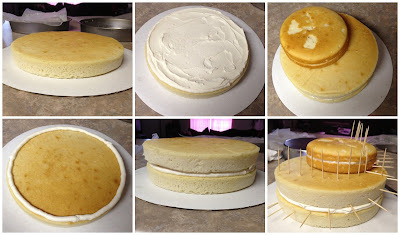 Bake for 22 - 25 minutes, or until the tops of the cakes are springy and a tester inserted in the centers comes out clean. Cool completely. Once cooled, cut small cones out of the top of each cake with a paring knife. Then, cut the tips off of each cone, creating a small lid for each cupcake. You’ll replace the “lid” once you’ve filled the cupcakes. Then, make the crème filling. Place the butter in the bowl of a stand mixer with paddle attachment (you can also use a hand mixer). Add the syrup, salt, orange extract (if using), and vanilla and mix on medium-low til combined. Turn the mixer to low and slowly add the powdered sugar til consistency is smooth but not too thick to spread (similar to the inside of a Cadbury egg). Using icing bags or a ziplock with a small hole cut in a corner, fill each cake partially with a small amount of yellow crème filling, following with the white crème filling. Replace the tops of the cupcakes to seal in the filling. In the bowl of a stand mixer (or with a hand mixer), cream the butter til light and fluffy. Slowly add in powdered sugar until desired consistency is reached. Add in milk (I use anywhere between 1-4 tbsp depending on the day and my mood) and Cadbury crème and beat til fluffy. Add in vanilla to taste and additional powdered sugar as needed to maintain consistency. Separate out 1/3 of the buttercream into a smaller bowl. Tint with yellow food coloring as desired (again, stick with the liquid stuff. The gel is a joke as you can see from the lack of color in my photos). Frost cupcakes first with white buttercream, then a swirl of yellow. Top with a mini Cadbury egg. 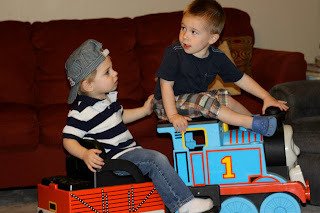 Aren't they fun?!? Enjoy, y'all. Gotta love a four-day wekend, right? It's such a blessing that my office gives us both Good Friday AND Easter Monday off. It's a nice time to stop, breathe, and catch up a little. Especially after the weekend I had - not that I'm complaining. It was only busy because we have so many sweet people to share our time with. So, I'll give you a recap - day-by-day to make it easier. We started our weekend with a Ben Rector concert at George's. Ben was awesome, as always, and even sang a couple new songs that I can't wait to get, particularly his "I Like You" song. Heard it yet? It's lovely. If you decide to get so tipsy at a concert that you bump into me while Instagramming the twelfth selfie of you and your friends of the night, I will push you back. If you fall over, it's not my fault. And I will laugh while not helping you up. If your date is so tipsy that she cannot hold herself up, it is not my job to help you with her. If she leans against me, I will move out of the way slightly. If she falls over, it's not my fault. If you consistently block my view with your smartphone because you're trying to Vine the whole damn concert, I will slowly increase the volume of my passive aggressive comments made in your direction until they can be heard over the music. Vine that. It is not my job to forfeit my hard earned spot on the jam packed floor so that you can "dance" with your date. Take it elsewhere or don't bump into me. And don't you DARE give me a dirty look when I don't move for you. Unless you want me to kick you, that is. Ok, off my soapbox now. Keep it classy, Fayetteville. I spent the afternoon crafting an Easter basket for The Boy. I found a tie that matched my dress so preciously that I couldn't help but get it for him. I added a few hidden-message eggs to keep it festive. Ever made hidden-message eggs? It's not as simple as you'd think, but after the first one, it gets a whole bunch easier. 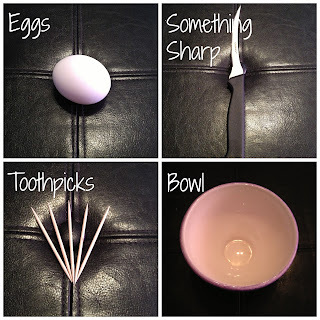 If you wanna try it next year, here's what you'll need: eggs, something sharp (like a knife or needle), several toothpicks, and a bowl (or sink). You'll poke a hole in both sides of the egg, making one hole larger than the other. 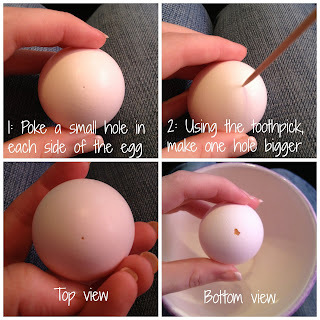 Then blow air through the egg on the side with the smallest opening. It helps if you shake the egg up a little to loosen the insides a bit. I then ran water through mine and let them dry overnight. 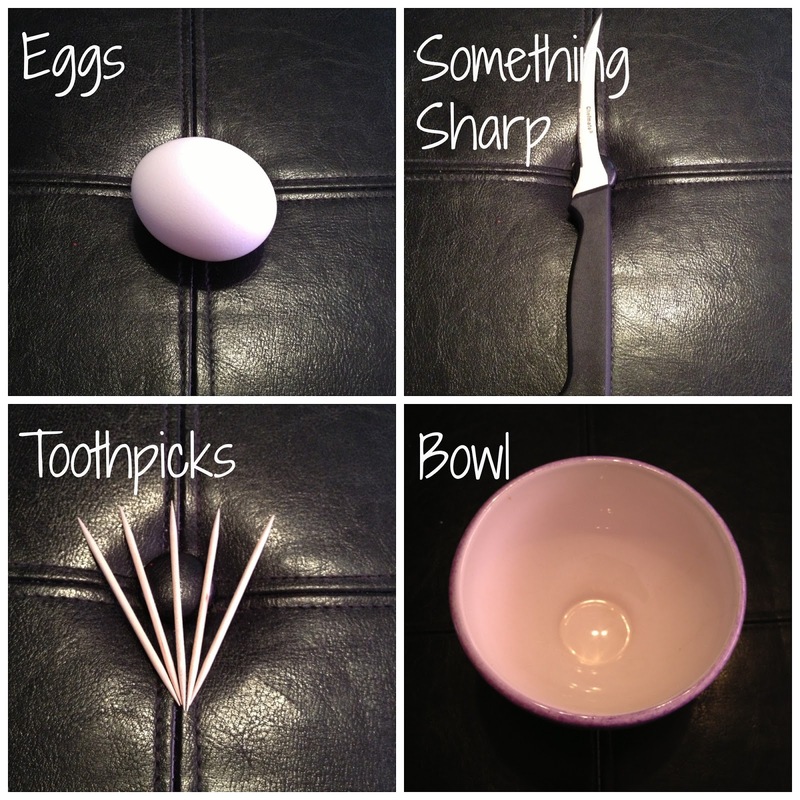 Once dry, I wrote tiny notes for each egg, rolled them up, and slipped them into the egg. 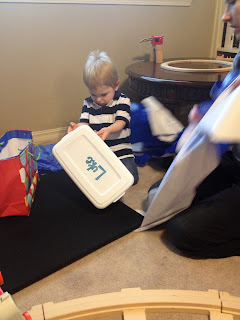 He had to crack them to get to the message - which I think is WAY more fun than opening the plastic eggs. 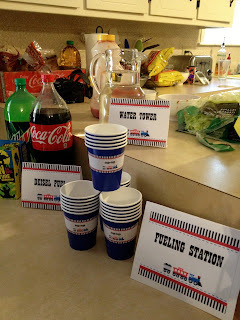 That night, we went to the Good Friday service at TGC, during which The Boy played a beautiful solo, and wrapped up the evening over milkshakes and games at our friends' new house. I started the morning out with a manicure - love having fresh nails - then met The Boy in Bentonville for lunch. His sweet cousin Emma has recently decided to attend the U of A for college and we wanted to get together with her for a quick chat about what to expect, where to live (or not to live), where to eat (or not to eat), etc. We had lunch at the Station Cafe - a cute little restaurant on the square - and I put together a fun little "happy" (with a few of my favorite Fayetteville things) to welcome her to this sweet little town I love so much. If you're local and unfamiliar with any of the spots linked above, you haven't truly experienced the best this town has to offer. Go check 'em out. 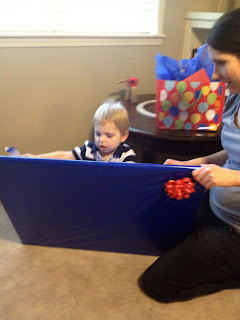 After lunch, we stopped by Gran's to deliver a birthday gift and steal some hugs, stopped at Bentonville's new fancy Harps for cupcake supplies, then swung by his parents' to borrow a cupcake tin and mixer. Cadbury Egg Cupcakes. Recipe to follow tomorrow. I love Easter Sunday. I love all the kiddos dressed up in pressed shirts and frilly dresses. I love the buzz in the air. I love how everyone smiles and hugs and just seems happy. This was one of those happy days. I ended up working in the nursery during the service (unplanned but a blessing just the same), meaning I missed the message. However, I've found that my mornings spent surrounded by two year-olds proclaiming that "Jesus is alive" are sometimes even more of a message than one delivered from the pulpit. 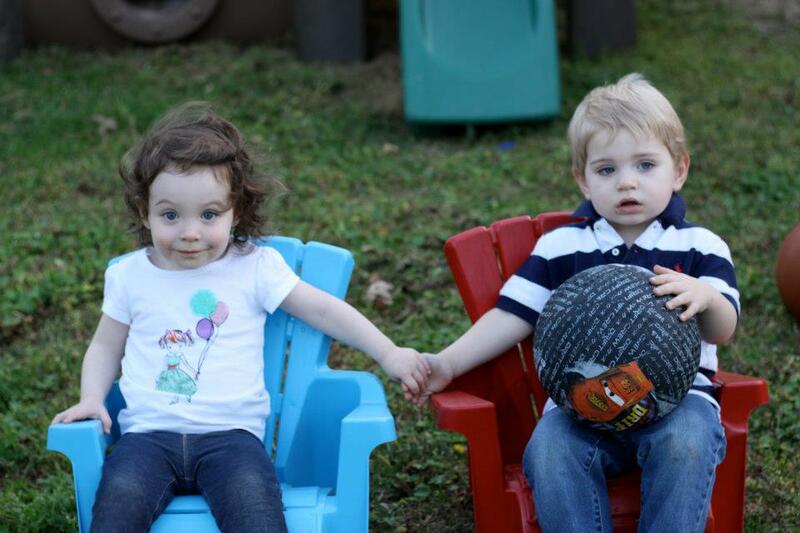 Those sweet faces made my morning. 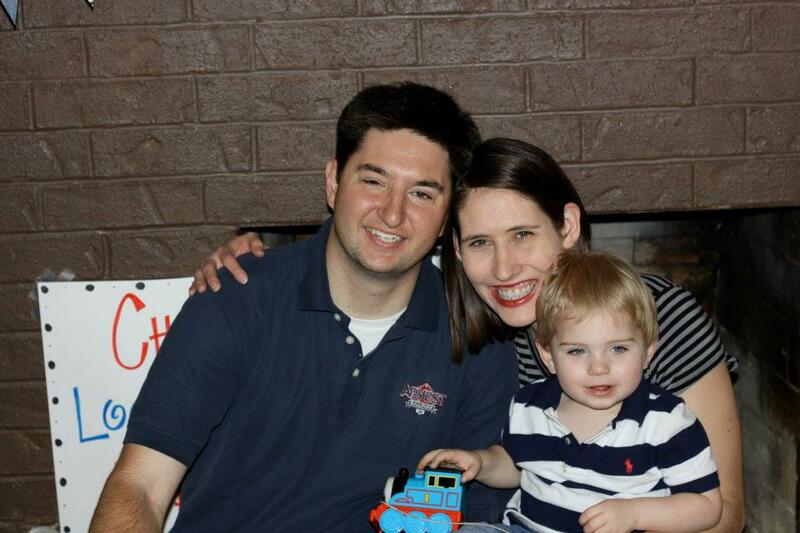 After church, we met my family in Rogers for lunch and an Easter egg hunt. We had a great time finding the eggs the kids missed and re-hiding them...in places they'd already checked. 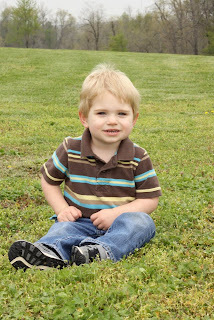 Josh kept finding eggs in the same place and exclaiming "wait...I already found this one! What's going on?!?" After time with my family, we headed over to The Boy's parents' for coffee and cake...and croquet it turned out. It was such a lovely day that we couldn't stand to be inside. And, since croquet is pretty much the one game you can play in a dress and heels and without the threat of something flying at your face, it won. Watching the adults explain the game to the kiddos was about as much fun as the game itself. Oh, that and chasing down dogs that were chasing down croquet balls as they rolled across the lawn. Don't try to play croquet with two dogs that are obsessed with fetch. People will laugh at you as they ride by on their bikes because you're shouting "No, Gigi. Drop it. Give it back. Okay, now where was this one again?" Everyone seemed to enjoy the game, though. Even if The Boy did beat me on purpose (I was totally beating him, by like A LOT, and after I pointed it out, he made this stupid comeback and beat my by about four turns...tell me that wasn't deliberate). After the game, we spent the afternoon on the porch, watching the girls play with dolls and trying to keep the dogs from fighting over EVERY TOY THEY COULD FIND. At one point I ended up with three bones in my lap to stop the arguing. All in all it was a good weekend. 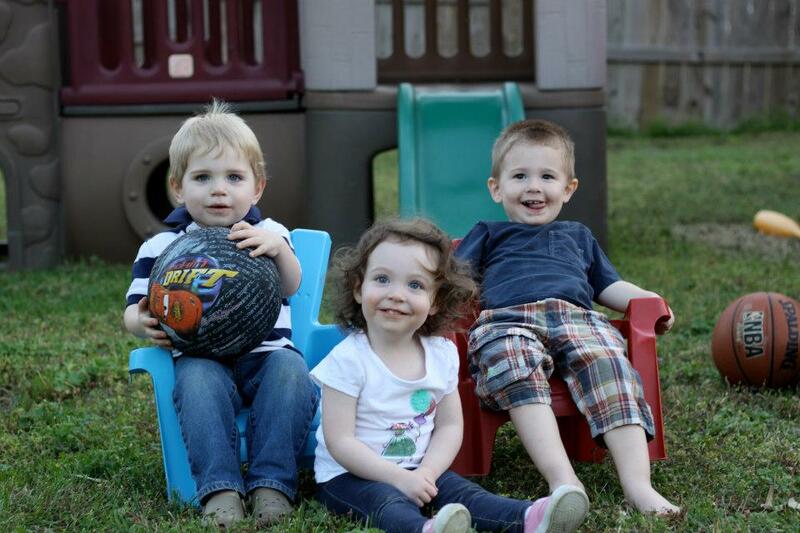 A sweet, restful time with family and friends and beautiful weather to boot. Hope y'all's was equally enjoyable.